You're BRILLIANT and the World Needs to See It! No doubt about it… you have brilliance inside of you. There is something that you do better than anyone else. Something you can’t stop talking about or showing people how to do. 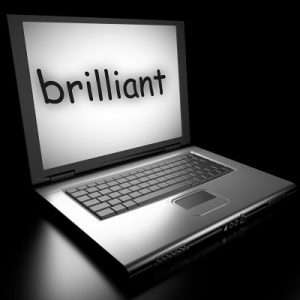 The world needs to see your brilliance! You’re doing it already. You just need a bigger platform. The Internet is that platform and you can use it in various ways. Ideally, you want one main website that showcases your brand… who you are… what you do… how BRILLIANT you are and what makes you YOU-niquely so. Then you use Social Media, your book, word of mouth, business cards, networking, etc. to drive people to that website. You share real, relevant and insightful content on your blog that actually helps people (there’s a new concept) and keeps them coming back for more. As long as you give yourself an excuse, you’ll never do what you really wanna do with your life. Don’t let fear of technology keep your dreams on the shelf. With platforms like WordPress, the online world is an even playing field. Anybody can do it… really. It doesn’t take a lot of money to start… but that’s the key. You have to start somewhere. It will take time and commitment but what business doesn’t… anything worth having takes some type of commitment, right? I’m an Information Marketer who LOVES helping other Information Marketers breeze through the technical stuff that’s keeping them stuck… the stuff that’s keeping them from sharing their brilliance with the world. Just believe me when I tell you.. you CAN do it!